Manipur Governor Najma Heptulla on Friday slammed Pakistan foreign minister Khawaja Asif for his reported statement that Bollywood star Salman Khan was sentenced to five years in jail in a blackbuck poaching case, as he hails from the minority community. She said that the Pakistan foreign minister has no business to interfere in India’s internal affairs. 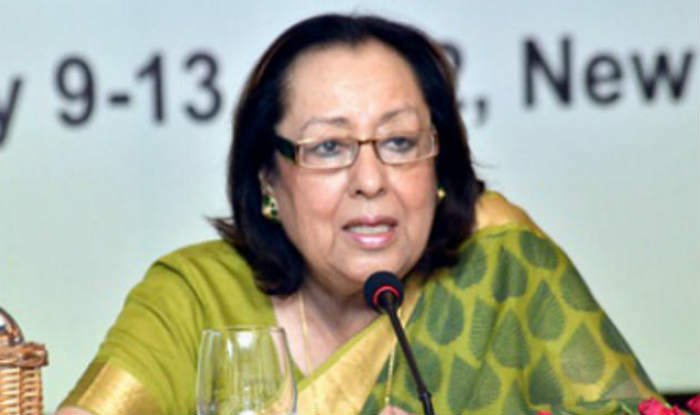 Heptulla told newsmen at Raj Bhavan here that in this country, individuals irrespective of religion, caste and creed, are punished on the basis of the crimes committed by them and there is no segregation based on “minority” or “majority” as claimed by the Pakistan minister. If the actor made a mistake, he has to pay the price, Governor Heptulla added. “India has her own Constitution, laws and can solve its own problem,” she told reporters at Raj Bhavan here. Her reaction came after Khwaja Asif had reportedly told a Pakistan TV news channel on Thursday that Salman was sentenced to five years in jail by a Jodhpur court as he hails from the minority community. India has not interfered into the affairs of the neighbouring country, she said adding that Pakistan should concern itself with its own problems and not bother with the internal affairs of India. “Pak has no right to interfere in the country’s internal affairs. We can take care of our problems and we have proper Constitution and laws,” Heptulla said. Salman Khan was sentenced to five years in jail and fined Rs 10,000 by a Jodhpur court in connection with the killing of two blackbucks near Jodhpur in October 1998, while he and a group of other actors were in Rajasthan for the shooting of the film ‘Hum Saath Saath Hain’.